Lapointe, Pierre Louis. "Sainte-Marthe-du-Cap". The Canadian Encyclopedia, 04 March 2015, Historica Canada. https://www.thecanadianencyclopedia.ca/en/article/sainte-marthe-du-cap. Accessed 22 April 2019. Sainte-Marthe-du-Cap, Qué, Unincorporated Place, pop 6289 (2006c), 6162 (2001c). Sainte-Marthe-du-Cap is a semi-rural residential community of TROIS-RIVIÈRES. Sainte-Marthe-du-Cap used to be part of the parish municipality of Sainte-Marie-Madeleine-du-Cap-de-la-Madeleine, today's CAP-DE-LA-MADELEINE, its western neighbour. Both communities were included in the Seigneury, Cap-de-la-Madeleine, granted to Father Jacques de la Ferté by the COMPAGNIE DES CENTS-ASSOCIÉS in 1636. 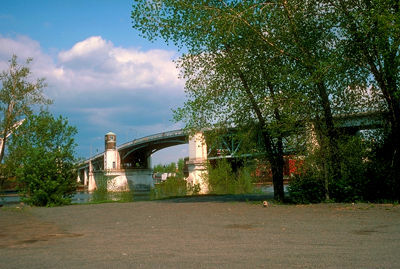 Sainte-Marthe-du-Cap became a separate municipality in 1915 and a town in 1998; in 2002 it became part of the city of Trois-Rivières. Its name, honouring Mary Magdelen's sister, Sainte Marthe, symbolizes the linkage with Cap-de-la-Madeleine, well-known for Notre-Dame-du-Cap, a shrine to the Virgin Mary. Although agriculture has always been the backbone of the community, an iron mine was in production from 1890 to 1967.